Taco night has been a longstanding tradition in our household, long before we relocated to Chicago. But the rich Mexican community here and the abundance of delicious taco joints has inspired us to take taco night to a whole new level. Taco night used to mean seasoned ground beef served with a few colorful bowls of toppings. Fun, but nothing special. Now our taco nights are a feast of flavors and textures, from lime marinated shrimp to slivers of grilled skirt steak. Fiesta! When grilling season returns, we desert the taco joints and make our own at home where taco nights become al fresco affairs, with the kids running around on the lawn as we linger over our last taco. Once I’ve assembled the little bowls of fun toppings and set them on the table, the marinated steak and shrimp grill up in minutes. I love it when dinner is easy, quick, and a crowd pleaser. 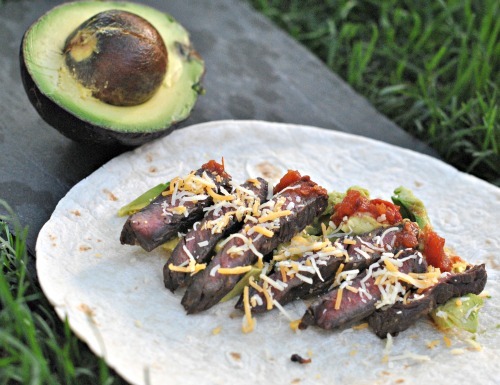 Steak Tacos: perfectly cooked medium rare skirt steak with avocado, salsa, and cheese. HEAVEN! 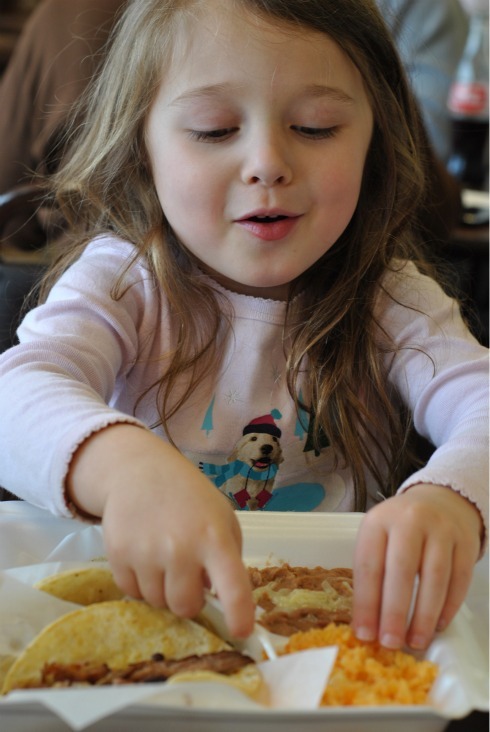 My tacos are usually overflowing with a lot of toppings, but most of my kids like their tacos more plain. Seasoning the meat and shrimp becomes particularly important when they’re the only ingredient in the taco. Nothing too spicy, but still the right set of spices that give a particular festive summer flavor. For steak, we use a sweet Asian influenced marinade with lots of soy sauce, sesame oil, honey, lemon peel and a dash of ginger. The shrimp is also heavily citrus infused as well as garlic powder, a dash of dried jalapeno for a hint of heat and any fresh cilantro that’s ready to harvest in my newly planted garden pots. The toppings are where the tacos can get really twisted and crazy. Sour cream, cheese, salsa, and avocado are traditional and we would never dream of leaving them out. But fruit is a great way to invite the kids to be a little more adventurous in their taco creation: kiwi, pineapple and mango are pretty and exotic. Grilling them along with the meat and fish caramelizes them and brings out even more flavor. We’ve also included cut up grapes and roasted sweet potato chunks as part of the mix: anything to inspire the kids to make their next taco a little more loco. In a bowl large enough to hold the shrimp, juice the lemons. Add the spices and honey and mix well with a fork. Toss in the shrimp and refrigerate for an hour. Preheat the grill on high and then lower the heat to medium. Grill the shrimp two minutes on each side until pink and nicely seared with grill marks. Serve on soft tacos with mango salsa. In a large bowl, mix the soy sauce, sesame oil, rice wine vinegar, garlic powder, lemon zest, and honey. Add the steak, tossing to coat. Marinate for 2-3 hours or overnight. Preheat the grill to high. Once really hot, lower the heat to medium. Sear the steak on one side for 3 minutes and the other for 2 minutes. Remove the steak from the grill and slice at an angle into ½ inch slices. Serve with hot tortillas, cold avocado slices, chunks of pineapple, salsa of your choice, and plenty of Mexican cheese mix. What’s your favorite taco recipe? The McCormick spices Pinterest page has tons of great taco recipe ideas to get you inspired. There’s a great contest going on right now for 30 people to win a kit of assorted spices from McCormick for their future taco nights. To be entered to win, just follow the McCormick Pinterest page and repin five recipes from McCormick’s Taco Night Pinterest board to their own boards using the hashtag #McCormickTacoNight and tagging @FrenchFoodieMom in each repin. Readers who participate will be randomly selected by The Motherhood . 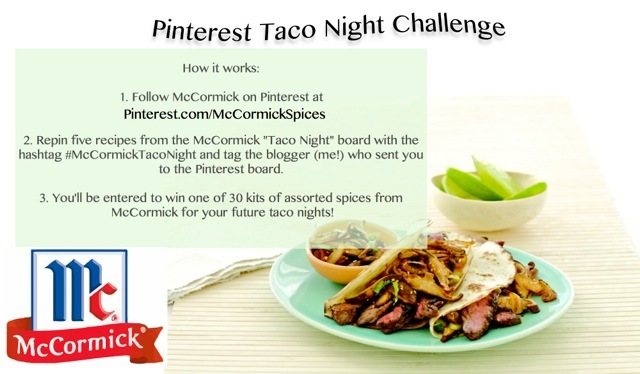 This post, along with the Pinterest contest is part of a taco night campaign sponsored by McCormick spices and coordinated by the Motherhood. 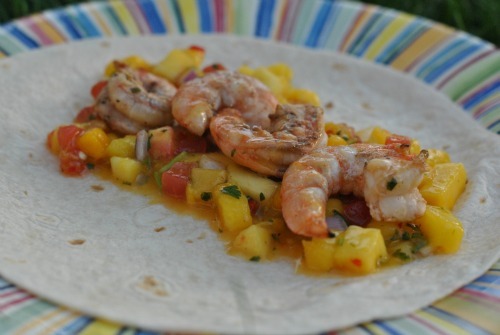 4 Responses to Mango Shrimp Tacos and Asian Steak Tacos: Taco Night Al Fresco Fiesta!